Mini-charity review of Hillcrest Christian College Limited (HCC), an organization that is connected, through the cross directorship of Jame Lewis, to the CMA Standards Council, a body that accredits those organisations who pass its ‘Nine Principles of Ministry Accountability’. HCC is not accredited. HCC does not invite feedback and complaints from other than students, parents and employees. The directors come from the members of Reedy Creek Baptist Church, a charity that doesn’t have to lodge financial statements because it is a ‘basic religious charity’. HCC is a public company, a company limited by guarantee. Although it does not have the provisions in its constitution to allow it to omit ‘Ltd’/‘Limited’ from the end of its name, it has Hillcrest Christian College registered as a business name. HCC operates – according to the ACNC Register – only in Queensland. Although it conducts fundraising, it doesn’t have a licence. Perhaps it believes that it is because it is a religious order, or because all fundraising is done by a parents and citizens association (two of the exemptions)? See the video on the homepage, then ‘Our College’ in the main menu. The first cornerstone of the foundation is our belief that the College has a spiritual ministry to its students and an evangelistic outreach into the community. The most important subject that is taught every day is God and the most important book that is used is the Bible. Our objectives are to be good stewards of the time that the Lord has given us, to minister to the children in the college, to bring each child to a personal saving knowledge of Jesus Christ, and to train them in the fundamental truths of the faith. With $18.79 m expenses divided into only three figures (see below), there is no way of even estimating this. This is not prohibited by their constitution. There is insufficient disclosure of the expenses to check for a payment. Not to HCC, but the ABN record says that you can if you donate to either of its two funds, Hillcrest Christian College School Building Fund, or Hillcrest Christian College Ltd Foundation Scholarship Fund. From the lack of mention on the website, though, it appears that neither are active. Yes (four months after their year-end; ten days earlier than last year). But if you are considering a large donation, I would ask for audited financial statements (see below), and more up-to-date financial information – the accounts are for a year end that is now over 13 months ago. ‘Type of financial statement’ and ‘Financial statement consolidated with more than one entity?’ are blank. Or is that a consequence of the ACNC’s special treatment of non-government schools (see below)? The ACNC receives financial information for this school from the Department of Education and Training and publishes it in Section E: financial information of the Annual Information. So not only no financial statements but no audit report. And this for a charity with revenue of $22.14 m. Contact the school if you want more. Employee expenses: $12.35m. 66% of expenses. Interest: $334K. 2% of expenses. Surplus: 15% of revenue. Why is it this high? Current liabilities are 1.4 times current assets. Not so good. No non-current loans – why then the interest paid? Long-term financial structure, because of $30.08 m in non-current assets (presumably mostly land and buildings), is sound. NA. The system of reporting for non-government schools like HCC effectively says to you, ‘Trust me’. The website says these people. The introduction to the list says that there should be seven members, but then lists eight. The ACNC Register (under ‘Responsible Persons’) has the addition of Jame Lewis, and doesn’t have Nadine Harvey and Alan King. The directors are responsible to the members of the association. The constitution provides that they must be members of Reedy Creek Baptist Church. The number of members is not disclosed, so we cannot assess the accountability possible via the members. To whom are HCC accountable? HCC does not mention accountability on its website. It gets government funding, so there is accountability there. As a charity, it is accountable to the ACNC. As a company it is accountable to ASIC. SUQ has a Complaints and appeals policy – public. Feedback is not mentioned though. It has a subsidiary, Body Corporate for Hope Central. No ABN could be found for this entity. SUQ is a public company, a company limited by guarantee. It has many business names. None are disclosed on the ACNC Register. Only one, School Chaplaincy A.C.T., is disclosed on Australian Business Register. Although it is permitted to omit ‘Limited/Ltd’ at the end of its name, it has no licence to trade under other than Scripture Union Queensland. The website and its social media pages contravene this. It only has a fundraising licence Queensland. There are five other states that have a licensing regime applicable to charities. SUQ doesn’t explain why they have only one licence. SUQ, per the ACNC Register, does not operate overseas. Plus, this program has its own website: https://sucamps.org.au/. And it appears that another separate website, https://su-schoolies.com/, comes under ‘Camps’. Provided chaplains in over 800 state schools, ran over 105 community camps, ran at risk (sic) programs, training (sic) 60 youth workers to diploma and certificate (sic) IV levels. A fuller description is in the Annual Report 2016. Does SUQ share the Gospel? The national rate is 13 complaints of proselytising per annum (three year average). With 2,900 schools having chaplains, the rate of proselytising complaints is 0.4 per cent per annum, and has been declining year on year. In 2013, there was one complaint nationally. SUQ is required, by its accreditation with the CMA Standards Council (Standard 1.2) to have a statement of faith. There isn’t one on the website, nor is there a ‘What we believe’ section. Standard 5.6 of the CMA Standards Council standards (see above) requires that regular program evaluations must be performed. There is no mention of these on the website. SUQ says that 84% goes to ‘Programs’. By deduction this is ‘Chaplaincy expenses’ and the undefined ‘Ministry expenses’. The Financial Report 2016 does not have a sufficient level of disclosure to say whether there is any ‘administration’ in these two expenses. The SUQ governing document does not permit this. Note 10 says that they are not paid. The ABN record shows that you can claim a tax deduction for a donation both to SUQ and to its fund, Scripture Union Queensland Schools Ministry Fund. The ‘Choose where my gift goes’ page, however, distinguishes between those causes that are ‘tax-deductible’ and those that aren’t. They say, below the fold on the ‘Donate’ page, that ‘Your credit card details are never stored with us. They are sent straight to our payment processor over a highly secure connection.’ The name of the provider is not given. Yes (lodged four and a half months after their year-end, two months later than last year). The financial information is for the group, not SUQ. It incorrectly says that there is no consolidation of entities. ‘Other Income…’ and ‘Employee expenses’ are incorrect. The business names are omitted. Is it really the case that there are exactly 500 full time and 200 part time employees? Disclose basic information on the subsidiary, Body Corporate for Hope Central [Note 19]. There is no other mention of this entity in the Financial Report, nor on the website. This entity has negative equity (Note 20)? Include all the disclosures required by the Accounting Standards for the Consolidated Statement of Comprehensive Income. Likewise, the Consolidated Statement of Changes in Equity. Separate ‘Other income’ from ‘Revenue’. Although ‘Other income’ is only 4% of revenue, it would be interesting to know what is included in this $1.41 m.
Use one of the two expense classifications allowed by the Accounting Standards, not a mixed classification. Disclose information about related parties. (There is only a Note on ‘Controlled entities’. For instance, what is the relationship between SUQ and Scripture Union Australia? (it owes $145K). Distinguish between ‘Objectives’ and ‘Principal activities’ in the Directors’ Report (and report on both). Give a breakup of ‘Ministry Reserves’ (so that donors + know the purpose of retaining some of the profits for the future). The fact that they can ‘appropriately manage and track chaplaincy and other ministry reserves internally’ is not relevant to a decision about whether to disclose information to stakeholders – external reporting should not be a management tool for an organisation of SUQ’s size and complexity. It would be helpful if we knew how many ‘key management personnel’ shared the $619K. Remove ‘Workers compensation insurance’ from the figure for employee benefits [Note 3]. Because of the above not immaterial issues, it is arguable that the financial statements are not ‘complete and accurate’, and therefore Arrow is not complying with Standard 6.1 of the CMA Standards Council standards (see above). Surplus as a percentage of revenue increased from negative 10% to a little over zero positive. ‘Cash and cash equivalents’ represents approximately two months of revenue. Employee benefits was 77% of expenses. Current assets as a multiple of current liabilities (working capital) was maintained at a positive 1.8. With only $744K of non-current liabilities, long-term financial structure is, based on this report, sound. The auditor, A F Newman, for Grant Thornton Audit Pty Ltd, issued a ‘clean’ opinion. It is long overdue in selecting an ‘Entity Subtype’. ‘Other Name(s)’ is missing the 11 business names. Two long lists under ‘Choose where my gift goes’, one for tax deductible projects the other for non-tax-deductible projects. There is no disclosure beyond ‘Chaplaincy expenses’ ($22.70 m) and ‘Ministry expenses’ ($4.68 m). There are eight (8) charities with a Ruth Limkin as a board member. Her LinkedIn profile says that she is also a director of Christian Super and, although not shown as a responsible person, Northside Christian College. So that’s at least ten directorships. But the register only covers charities, not all not-for-profits, and of course doesn’t include for-profit organisations. Therefore, if after eliminating the charities for which SUQ’s Ruth Limkin is not a director, you are left with the total being more than a handful, it would be legitimate for you to question whether her ability to discharge her fiduciary responsibilities is threatened. The quorum for a board meeting does not meet the requirements of SUQ’s accreditation with the CMA Standards Council (Standards 3.2, 3.3). The Board is responsible to the membership. When last disclosed (30 June 2016, Directors’ Report), there were 94 members. To whom are SUQ accountable? Its ‘Charity Tick’ is used on the website in support of you giving to them. And rightly so, because it would be unwise to give to a charity that is unregistered. The ‘tick’ also means SUQ’s AIS is not overdue, and the ACNC has not taken any compliance action against it. SUQ has gone beyond the charity tick, and achieved accreditation with the CMA Standards Council. It is therefore entitled to display their seal – see the website footer. For this is must abide by the Council’s Principles and Standards of Responsible Stewardship. SUQ is also accountable, as a company, to ASIC. Arrow is a public company, a company limited by guarantee. It has two business names, ILG Group, and Arrow Marketplace Connections. Neither is disclosed on the ACNC Register. Although it is permitted to omit ‘Limited/Ltd’ at the end of its name, it has no licence to trade under other than Arrow Leadership Australia. The website and Facebook page contravene this. Arrow operates, per the ACNC Register, throughout Australia. It seeks donations on the internet. It has no State fundraising licences. Arrow, per the ACNC Register, does not operate overseas. See the first section here. These are the programs that give effect to that ‘calling’. Neither ILG Group or Arrow Marketplace Connections, Arrow’s two business names, are mentioned on the website. CMA (Christian Ministry Advancement Ltd), an unrelated entity, has ILG groups. There’s no annual report this year; next year one will be required because of their accreditation with the CMA Standards Council [Standard 8.2]. Does Arrow share the Gospel? The expenses are not disclosed in a way that allows an estimate of this. The governing document does not permit this. This is contradicted by the donation page. Here it says that a donation to The Brian Coombs Sponsorship Fund entitles you to a tax deduction. This is because Arrow is collecting for a third party, the charity ‘Annabel Charitable Foundation’ (actually The Annabel Charitable Foundation Ltd or Annabel Foundation). Arrow implies, here and elsewhere, that The Brian Coombs Sponsorship Fund is part of Arrow. Not only is The Annabel Charitable Foundation Ltd an unrelated charity, but the Fund does not even have an ABN. Their representations are therefore contrary to Standard 9.1 of the CMA Standards Council’s standards with which they must comply. Yes (lodged six months after their year-end, four days before the deadline, and the same time as last year). The Annual Information Statement (AIS) 2016 does not describe 2016’s activities, as it should, but just describes what Arrow does. With donors and participants in events numbering enough to produce revenue of over $1m, and operations throughout Australia, it is difficult to see how the directors could reasonably conclude, effectively, that all stakeholders, both past and prospective, have the capacity to ask the company to produce financial statements tailored to their individual needs. Disclose the arrangement with The Annabel Charitable Foundation Ltd (see above), and the effect on the accounts. Disclose information about related parties. Include a Note on related parties. What exactly was the issue that caused the auditor to qualify the accounts this year? What changes were made, if any, to avoid last year’s qualification? Include all the disclosures required by the Accounting Standards for the Statement of Changes in Equity. What was the reason for the prior period adjustment? Include intangibles in the accounting policy Note. Treat ‘Other income’ consistently between the Statement of Income and Expenditure and Other Comprehensive Income and Note 2. Surplus as a percentage of revenue increased from 2% to 6%. ‘Cash and cash equivalents’ represents 2.6 months of revenue (down from 3.6 last year). Employee benefits was 40% of expenses (up from 37% last year). Current assets as a multiple of current liabilities (working capital) was increased from 1.2 to 1.7. Although there was only 18K of long-term assets, similar liabilities only totalled $4K. The auditor, Peter Shields, for Saward Dawson, issued a qualified opinion (that is, not a ‘clean’ opinion). If the auditor concludes that the opening balances contain a misstatement that materially affects the current period’s financial report, and the effect of the misstatement is not appropriately accounted for or not adequately presented or disclosed, the auditor shall express a qualified opinion or an adverse opinion, as appropriate, in accordance with ASA 705 [ASA 501, paragraph 11, www.aasb.gov.au]. As is common for organisations of this type, it is not practical for Arrow Leadership Australia Ltd to maintain an effective system of internal control over the collection of donations and other fund raising (sic) activities until their initial entry in the accounting records. Accordingly, our audit in relation to fund raising (sic) was limited to amounts recorded in the accounting records. Silence on a similar deficiency this year means either that Arrow introduced controls over fundraising revenue, or the current auditor has different thresholds for a qualified opinion on this deficiency [ASA 510, paragraph 9, www.aasb.gov.au]. ‘Other Name(s)’ is missing the two business names. The Secretary is included as a ‘responsible person’. Money is collected for three programs. How much is spent on each is not disclosed. The money for one of them, The Brian Coombs Sponsorship Fund, does not belong to Arrow. It should not be included in revenue. For only one of the directors with a LinkedIn profile, Adam Lowe, is their Arrow role mentioned. As the Secretary, Amanda Otten is not a ‘responsible person’, she should not be included on the Register. There are 171 charities with an Adam Lowe as a board member, and 13 with a Christopher Edwards. But the register only covers charities, not all not-for-profits, and of course doesn’t include for-profit organisations. Therefore, if after eliminating the charities for which Arrow’s Adam Lowe is not a director, and likewise for Christopher Edwards, you are left with the total being more than a handful, it would be legitimate for you to question whether their ability to discharge their fiduciary responsibilities is threatened. The Board is responsible to the membership. When last disclosed (30 June 2016, Notes to the Financial Statements), there were 23 members. Directors are required to be directors (‘Governing document’), so it is effectively 14 people holding the directors accountable. To whom are Arrow accountable? Arrow was recently accredited by the CMA Standards Council. It is therefore entitled to display their seal – see the website footer. For this right it must abide by the Council’s Principles and Standards of Responsible Stewardship. Arrow is also accountable, as a company, to ASIC. When sent a draft of this review, on 18 June 2017, they…did not respond. For some unexplained reason, the trustee does not consolidate the affairs of the Fund, and has not taken advantage of the ACNC’s ‘Group reporting’ concessions. CKF is a public ancillary fund, a fund that collects tax deductible donations and gives them to funds who have Deductible Gift Recipient status. Crossway Kingdom Fund distributed funds in the 2016 year to eligible entities for the purposes of supporting – building project for a DGR charity – missionary work – ACCESS Ministries. The ‘DGR charity’ was Crossway Lifecare Ltd, another charity controlled by CBC. It received 96% of CKF’s distributions. Given that ACCESS Ministries has DGR status, that status means that it shouldn’t be doing ‘missionary work’. No – and nor should the recipients of their grants. There is no mention of impact in CBC’s publications. Expenses other than ‘Distributions’ were less than one percent of expenses. But ‘Employee expenses’ were zero. NA (and none when giving via the CBC website). Yes (four months after their year-end). ‘Interest’ is reported as ‘Other income’. The Report is shy a few of the Notes that are expected. The surplus as a percentage of revenue declined from a high 31% to a more typical 9%. Minimal short-term and no long-term liabilities. Almost: No ‘Entity Subtype’ is given. ‘Email’ and ‘Website’ are blank, but neither are compulsory. There are 14 directorships recorded for the name ‘John Peberdy’, and 8 for ‘Timothy Wilson’ (there are 12 but five are for the same charity). And the register only covers charities, not all not-for-profits, and no for-profit organisations. Therefore, if after eliminating the charities that don’t belong to the CKF director, you are left with their total being more than a handful, it would be legitimate for you to question whether their ability to discharge his fiduciary responsibilities is threatened. To whom is CKF accountable? As a public ancillary fund, to the ATO. When sent a draft of this review, on 15 June 2017, they…did not respond. Strathcona Baptist Girls Grammar School Limited. Despite this control, BUV have chosen not to consolidate the accounts of these charities, saying that this ‘would not be of practical value to users of these special purpose financial statements.’ It is therefore arguable that BUV’s statements do not comply with the ACNC legislation, in that they do not ‘give a true and fair view of the financial position and performance of the registered entity’ [Sec 60-10 (3)(a) of the ACNC regulations]. BUV has recorded in the Australian Business Register that it is an ‘Other Incorporated Entity’. But you’ll not find it where you normally find incorporated entities, the register kept by ASIC. It is instead a special case, a body with its own Act of Parliament, the Baptist Union Incorporation Act 1930. BUV operates (per the ACNC Register) in Victoria only. It asks for donations on the internet. It has no fundraising licences. Despite promoting a book with the subtitle The Six Practices of High-Impact Nonprofits, there is no indication that BUV are even assessing their impact. From the classification of expenses used by BUV there is no clear way to even estimate this percentage. Only if you give to its Fund, the Refugee Airfare Loan Scheme. Grow-Give-Go: If it is, it’s not mentioned until after you have entered your information on the first page. Refugee Airfare Loan Scheme: donations are invited but no facility provided. And ‘Empowered the leaders of Victorian Baptist Churches for mission.’ is not very helpful as a description of 2016’s activities. Two business names are missing. No explanation is given for the omission of ‘Other comprehensive income’. The directors give no explanation for their decision that ‘the Union is not a reporting entity’, that is, they have no users dependent on general purpose financial statements to make their decisions about BUV. The decision allows them to produce the lower standard special purpose financial statements. This is only the correct decision if any of BUV’s users, either present or prospective, can request BUV to tailor a financial report to their needs. With a paid staff of 36, ‘constituents’ collectively paying $1.00 m for membership, and control of six significant charities, this is not plausible. The Councillors’ Report (in the Financial Report 2016) says that ‘Insurance reserves totalling $539,321 were written back and taken up as revenue in 2016’. To do so is contrary to basic accounting, there is no ‘insurance reserve’ shown in the accounts, and there is no such movement in reserves. The division of equity between ‘Unrestricted Fund’ and ‘Reserves’ implies that the amounts in the latter are restricted. However, well over half of the total are ‘restricted’ only by ‘internal rules and charters’, that is, are free to be used by BUV at their discretion. The ‘Related Parties’ Note does not mention either Global Interaction (page two of the Financial Report) or Now and Not Yet Inc (also page two). ‘Other’ under Revenue is 16% of the total. A bit large to be unexplained. $431 K was paid in interest yet there are no loans. Why is the increase in trust funds included as a financial activity in the Statement of Cash Flows? The classification of the $38.95 m of investments does not follow that required in the Accounting Standards. A negative return on revenue (-5%) was reversed (3%). ‘Remuneration’ – presumably ‘employee benefits expense’ – declined from 56% of expenses to 49%. Working capital (current assets less current liabilities) remained slightly positive at 120%. Long-term liabilities are minimal compared to long-term assets. But he agrees with the directors’ decisions not to consolidate and to produce that the lower standard special purpose financial statements are appropriate (see ‘Does their reporting..’, above). Almost. It is missing information under ‘Other Name(s)’. 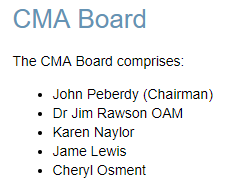 There is an organisation chart on the website, and a page on governance, but neither include the members of the board (Council). There are eight directorships recorded for the name ‘Allan Demond’. And the register only covers charities, not all not-for-profits, and no for-profit organisations. Therefore, if after eliminating the charities for which Allan is not a director, you are left with the total being more than a handful, it would be legitimate for you to question whether his ability to discharge his fiduciary responsibilities is threatened. To whom is BUV accountable?